My camera and I haven't been out much lately while I recover from my cold. Looking back at some of the very cold days we went out (and probably caught the jolly cold) here is another image from St James Park. If you look closely you will see all the birds sitting on the lake. Yes, I was number one. Is this the Serpentine? And did it freeze over in the recent cold weather? Wow, truly beautiful, the photo looks like a painting. 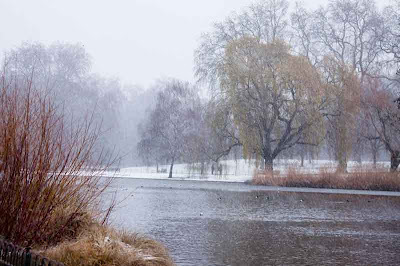 The London parks are amazing in any weather! Would swap with you in a second, the heat here is relentless. I have always been a winter person, and to be honest, there is no place like England when winter comes calling. Enjoy it.. I loved your shot ... I also enlarged it and could see all the ducks enjoying their dip! Sorry to hear you're not that well ... but I do so enjoy your photos even if it's not always a joy to get them.